Steve and I are pushing the envelope of Dionnysian good behavior this weekend — pushing her to see if she can be very, very good. 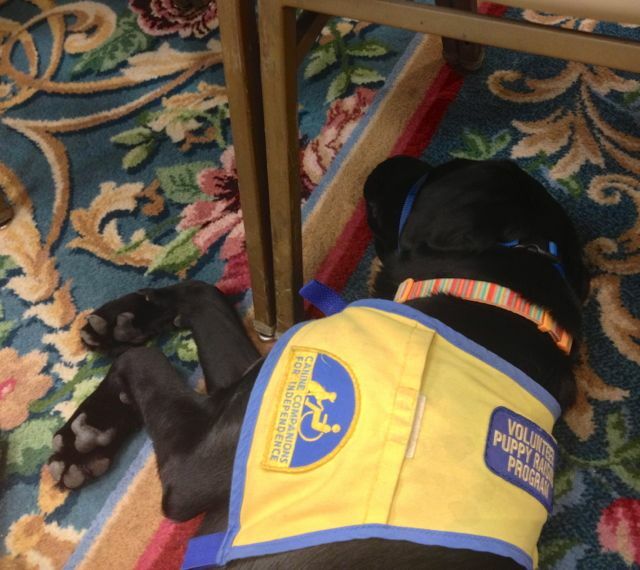 We’re attending a conference in Mission Valley and decided she should attend too. We started with an easy session at 1 this afternoon, in a large conference room that was less than half full. It was easy to nab aisle seats with no one in the adjoining spaces. Dionne went into the Down position and pretty much stayed in it, with minimal changes in position and only one whimper-filled nightmare. We arrived late for the next session, held in a much smaller room. Only a few seats remained, near the front of it. I gulped and marched forward with Dionne to nab one — the third place into the row of five. This was much more challenging. She went into her Down, but she’s now long enough so that she filled part of the space in front of the men sitting on either side of me. The old guy on my right seemed to be a dog lover. He even tried to pet her (NOT helpful) and whispered at one point that she was fine. But her excessive interest in his toes was not okay with me. The lanky young guy on my left looked much less pleased. (She thought his toes smelled intriguing too.) I swung her body so that it was positioned more directly in front of my chair. Then I spent much of the next hour shoving my foot in whenever she started to edge out of that space. After a long, long time, she settled down into a deep sleep. I had to wake her up when the presentation was over. nervous to photograph her in the second one. We left at that point but are about to return for the conference party and film that’s scheduled to be aired at 8 p.m. We’ll take her back again tomorrow too. How much of this can she stand? How much can we? I’ve been asked why Steve and I raise CCI puppies. For me it evokes the larger question: why have any kind of dogs at all? Multiple answers spring to my mind: they make me laugh, I appreciate being the recipient of their unconditional love, learning how to train them is more interesting than working on crossword puzzles, CCI graduate dogs can change people’s lives. It’s not so easy to pick the biggest benefit — the single best thing about living with them. But the worst thing about living with dogs is easy for me to finger: the hair. Unless you go the Way of the Poodle (or the presidential Portuguese Water Dog or some similar non-shedding breed), you live in a constant cloud of the stuff, particularly if you have more than one dog and if those dogs are large. Our house usually gets thoroughly vacuumed every Monday morning, and by Wednesday or Thursday, the dog hair begins piling up again, in drifts. I’m no clean freak, but it can get pretty disgusting. 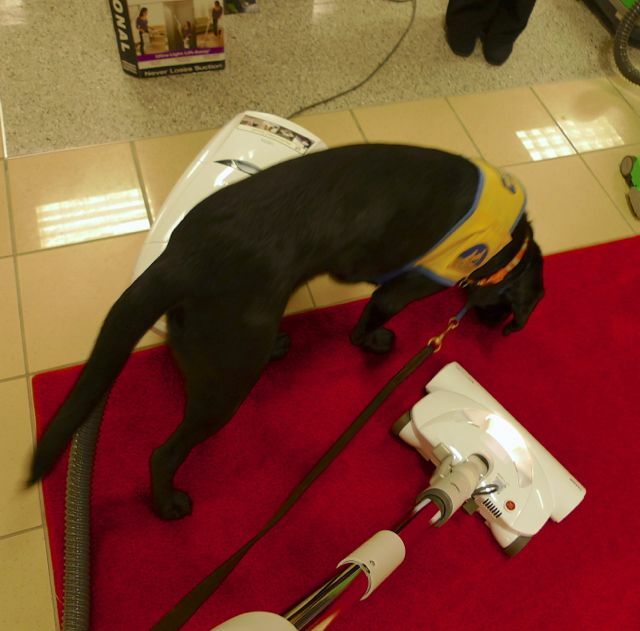 If you live with dogs, the vacuum cleaner is thus THE most indispensable household appliance. So the recent erratic behavior of our Hoover has been cause for considerable concern. Steve reluctantly began doing preliminary research for a replacement several weeks ago. He finally decide that Electroluxes aren’t worth their high price tags, and Hoovers have become junky. Online reviews convinced him that a Kenmore was probably our best best. So yesterday afternoon, he and Dionne set off for the nearest Sears outlet. 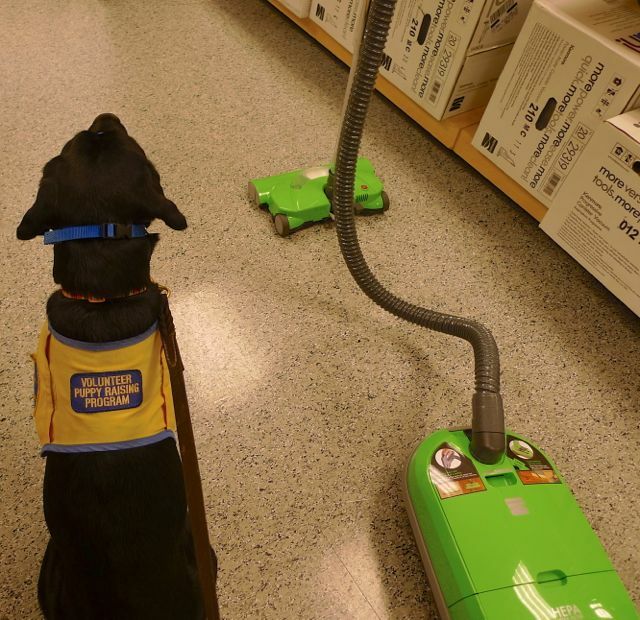 Although one hears stories about dogs who are terrified of vacuum cleaners, we’ve never had such a dog. Dionne doesn’t pay much attention to them, running or silent. Steve reported that she was calm and well-mannered as he talked to the salesperson and then test-drove several models in succession. 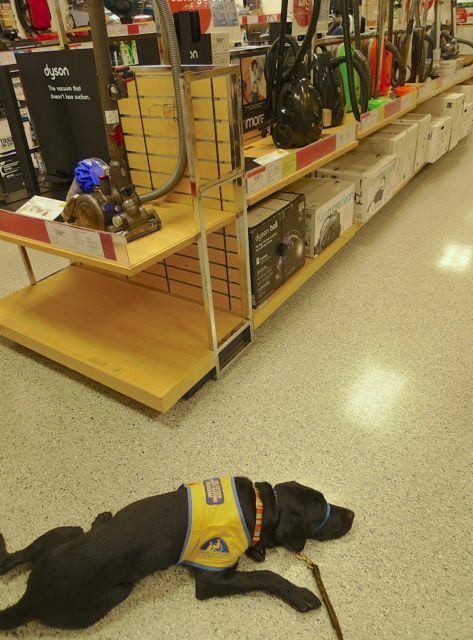 Vacuum-cleaning shopping can be exhausting. Eventually, the two of them settled on a promising model. They paid for it and brought it home. It will start getting vigorous workouts immediately. 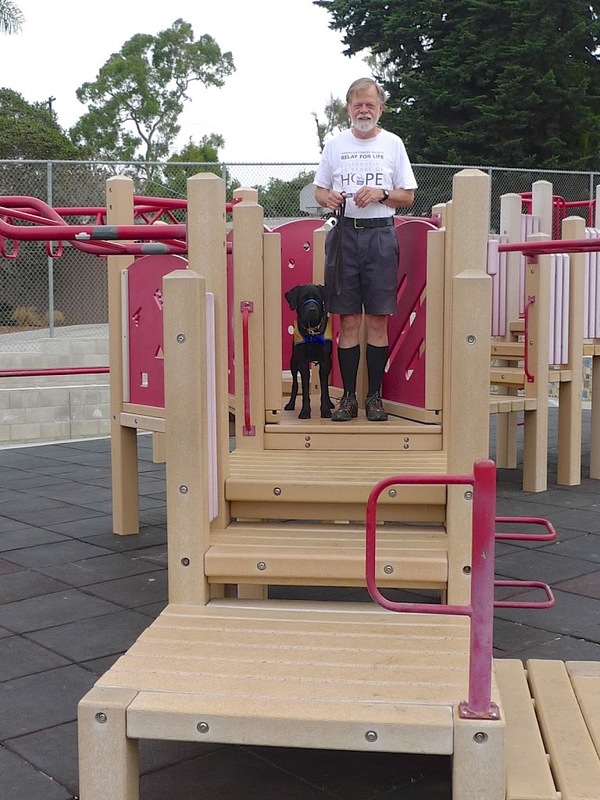 Steve and I walked with the dogs to the coffee shop this morning and stopped along the way at the climbing structure on the Bird Rock Elementary School playground. This is the same thing Dionne refused to step up onto just a week ago, because of the open treads that she has come to find so terrifying. But I followed the advice of our puppy-class teacher Bob Smith and lured her up just two of the steps. This morning, with Steve bearing the scraps of turkey, she bounded up all the way to the top without any hesitation. Progress! 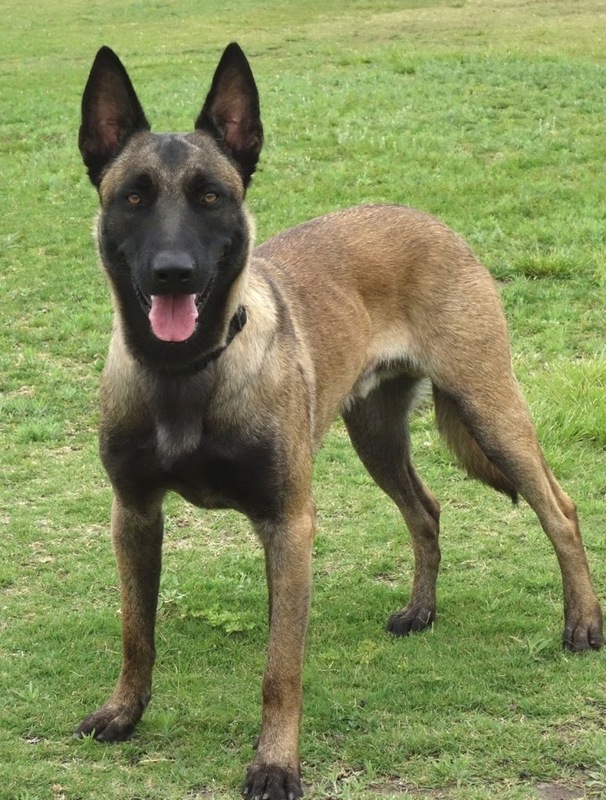 “Schutzhund?” a reader queried in response to my mention the other day that our friend Bob Schneider, who is working on the documentary about Dionne, trains dogs to participate in that sport. 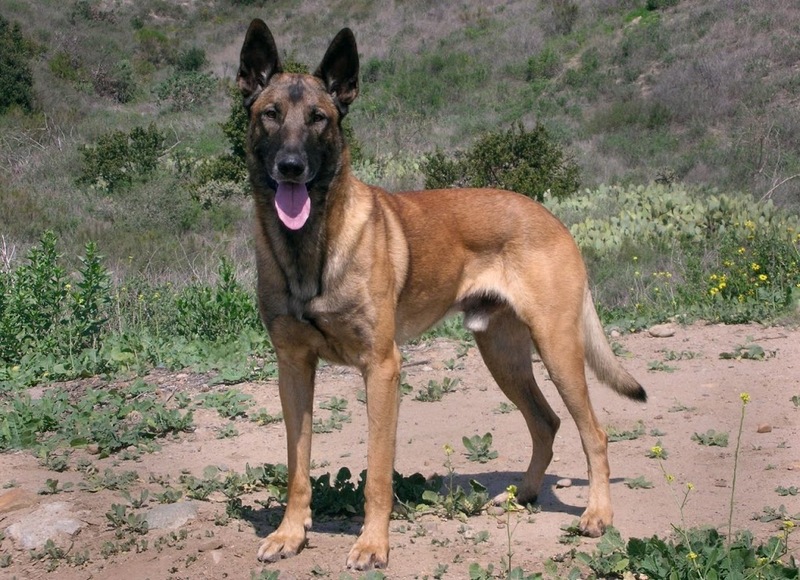 Schutzhund, I should have explained, is a pastime in which dogs and their handlers compete in demonstrations of the animals’ ability to track, obey (a large number of commands), and “protect”(finding simulated bad guys who wear protective padding — and then releasing them upon command.) It started a long time ago in Germany and originally had strong ties to policing work, but today people participate (in America and many other places around the world) largely for the pleasures of working closely with their pets on complex and demanding behaviors. 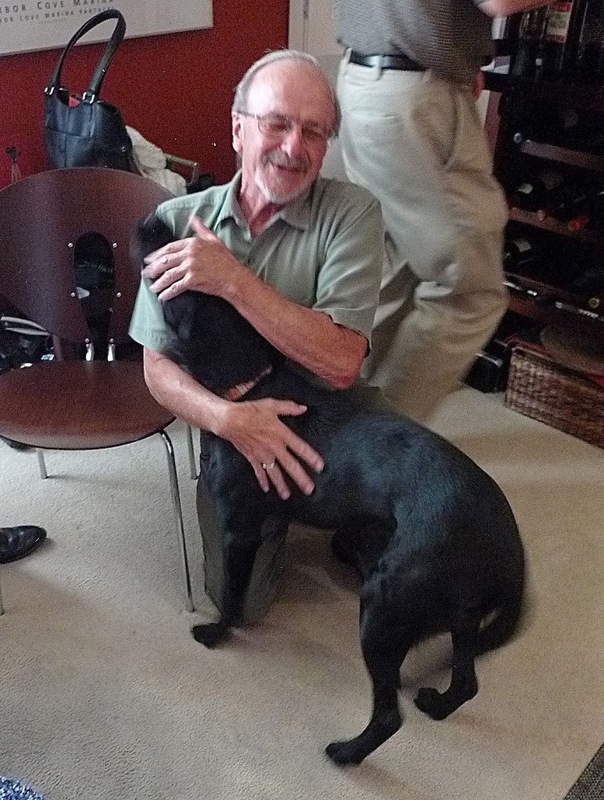 Bob has had four dogs who were specifically bred (in Belgium!) to excel at the sport. 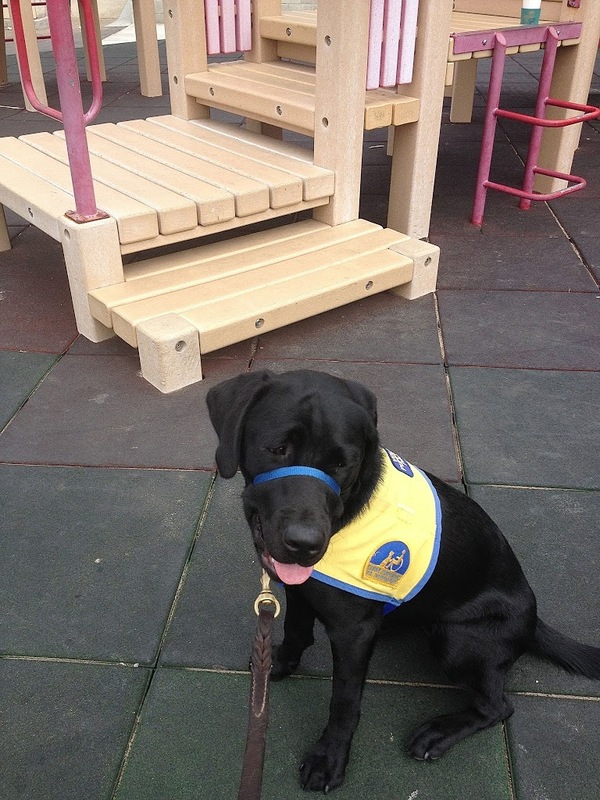 He competed seriously with two of the three, and is now hard at work training a handsome young fellow named Lux. Here’s Bob’s dog Bico when he was at 5. He’s now 11 and no longer competing. But he loves romping with Lux. she gets to love it up with Bob. This background makes Bob unusually attuned to the demands of puppy-raising and training. While raising a schutzhund champion differs in many ways from raising a service dog, the two activities also have a lot in common. Certainly Dionne adores him! So Steve bought a package of four new sponges last Saturday. Dionne has already destroyed two of them. Frankly, when the first of the new sponges disappeared last Sunday — less than 24 hours after being put out — both of us were incredulous that Dionne could have eaten the whole thing. We found some evidence that part of it and part of the next one did move through her digestive system (too gross to document photographically.) But in both cases, it didn’t look like a whole sponge worth of evidence. It was the remains of the sponge that disappeared a week or two ago. 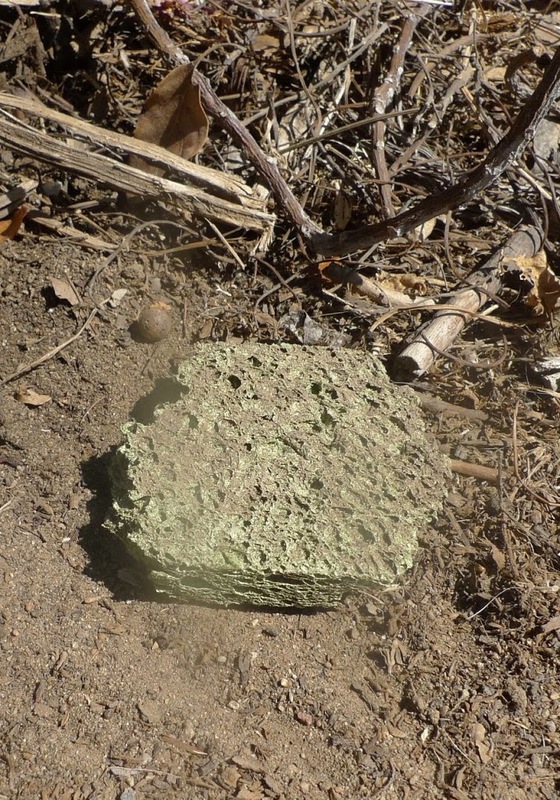 Obviously, she’d nibbled away a big chunk of its edges and then abandoned it, camouflaged by the dirt. Monday night in puppy class, Steve asked Bob about Dionne’s continuing fear of climbing stairs with open treads. I first reported on this back in January. Now a full seven months later, Dionne still acts terrified when Steve tries to get her to ascend the service staircase at our friend Albie’s condo complex. The other day, we noticed that there are open treads on the children’s climbing structure at the schoolyard near our house, so we tried to get her to ascend them. But even they struck fear in her heart. She dug in her heels and wouldn’t budge. Apprised of our continuing problems, Bob suggested taking along some treat of above-average succulence to the climbing structure. 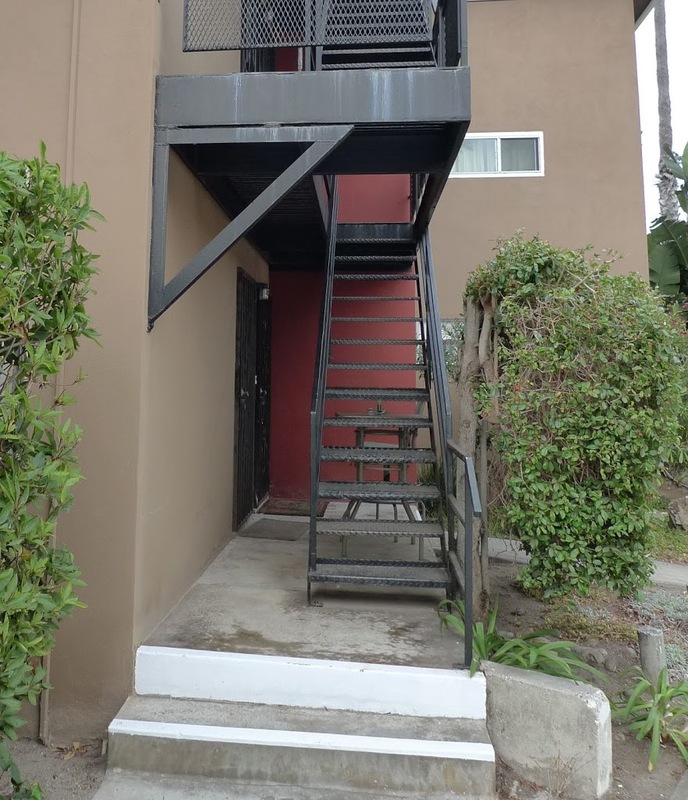 “Don’t ask her to go up more than just one or two stairs at first,” he counseled. So today she and I walked back to the playground. In my treat pouch I had… a piece of ham (slurp!) As we approached the structure, I dangled it enticingly, and sure enough, Dionne climbed up not just one step, but two. Then she froze. I remembered Bob’s instructions. I gave her some ham, and we descended to continue on our walk. On the way back, we made another stop at the climbing structure. Again, she mounted one step without much hesitation. Dionne’s life is being documented more thoroughly than any previous puppy of ours. Not only have I been chronicling her development in my blog, but she’s also going to be the star of a documentary! It’s being created by our friends Alberto Lau and Bob Schneider, both longtime professional photographers. 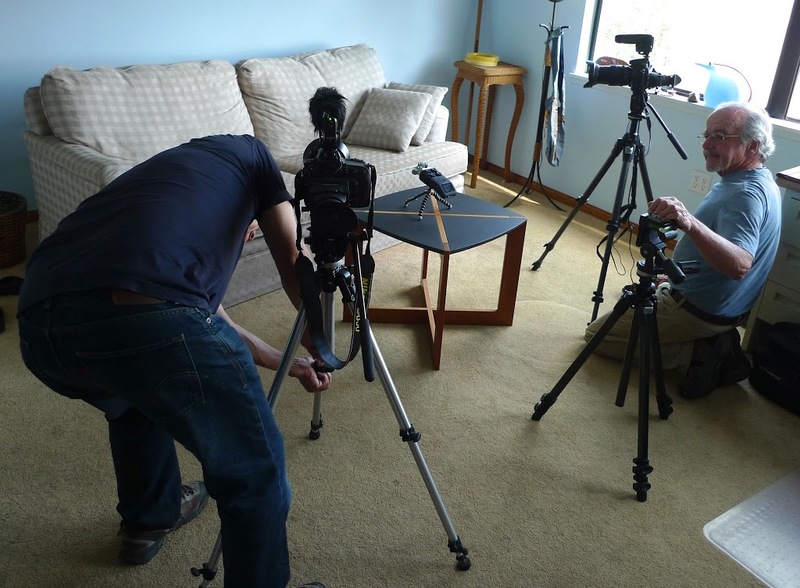 Now retired from their day jobs, the two of them have dived into a documentary project in which they’re telling the story of a local Holocaust survivor. They’ve apparently enjoyed that challenge so much that they want to do more. 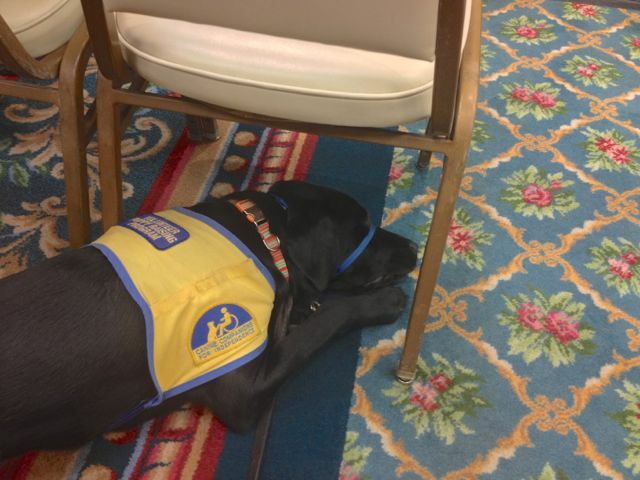 One of their ideas is to document what’s involved in raising a service dog. Steve and I have been bringing Dionne to regular movie-watching nights at Albie’s ever since we got her (in December). Bob often attends these too, and he’s among those who are most tolerant of Dionne’s sometimes trying presence. He’s not only a talented photographer and cinematographer, but he also trains his own dogs to participate in the sport of schutzhund. So far Albie has captured footage of our puppy drill team performing in the Coronado Fourth of July parade. Both guys came to puppy class two weeks ago and recorded the action there. Yesterday Bob and Albie spent a couple of hours interviewing Steve and me about our experiences with CCI pups. It takes an amazing amount of time to set up for a shoot. These guys have a ton of patience. Most exciting of all: they’re traveling to Chicago in two weeks to film one of the key figures in their Holocaust-survivor film. And while there, they’ve arranged to meet with Aimee and Yuriy Zmysly. They lived with the wonderful Mr. Brando, whom we raised and who graduated two years ago! I’m thrilled that Albie and Bob will get to meet all three! And I’ll continue to report on the documentary, as it shapes up.